Serial port toolkit to enable applications or scripts to communicate with a modem or other serial port device. This ActiveX control features full com port control, binary and ASCII data transfer, support for RS 232 and RS 485 standards and ISDN modem support. Can be used by ASP, ASP.NET, Visual Basic, Visual Basic .NET, Visual C++, Visual C# .NET or VBScript. Samples for all platforms and development tools are provided. 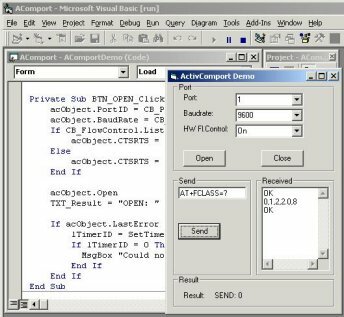 ActiveComport can control any device that has a serial interface (com port): a printer, a modem, an ISDN modem, a USB serial device, a network device, a computer, a weight indicator, a scanner, etc., and can be used on Windows 98, Windows NT, Windows 2000, Windows XP and Windows .NET platforms. Visit http://www.activexperts.com/activcomport to view online samples.